Yesterday, Mike announced the public preview of the upcoming changes to addons.mozilla.org (AMO). One of the new features that has been long-requested is the ability for developers to see how many update pings, or Active Daily Users, their add-ons have. Just like Firefox, extensions check for updates once a day, and we count how many times this happens for each extension. While the total number of downloads tells add-on authors about how many people have tried out their extension, the active daily user count tells them about how many people used it on a given day, although it’s not perfect. Only add-ons that do not have an updateURL specified are counted. All add-ons are required to have an empty updateURL when submitted to AMO. If an add-on is distributed from another website with an updateURL, those pings are not counted by us. Active Daily Users is not the same as saying “this many people use my extension”. Not all extension users use Firefox every day of the week, users can manually check for updates which will count false active users, etc. Many people keep extensions installed but disabled. The stats dashboard allows you to see the various statuses, such as enabled, disabled, incompatible, etc. Now that some background information is out of the way, on to the features! The first thing you’ll see in the stats dashboard is a summary graph that shows the downloads per day and active daily users for the last 2 weeks. Active daily users are currently only counted on Wednesdays, but will switch to every day in the future when we change around the back-end processing. Below the graph is a summary table that shows download information on the left and active daily user information on the right. The plot selector dropdown in the top left allows you to choose a graph to display: Downloads, Active Daily Users, or Active Daily Users broken down by Add-on Version, Application, Add-on Status, or Operating System. 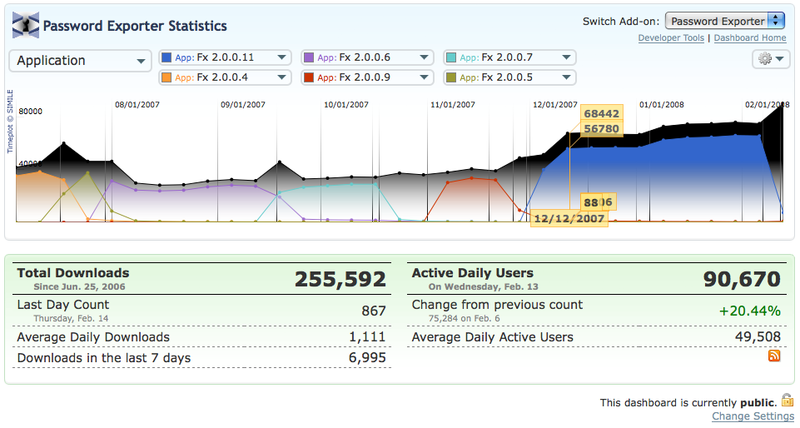 Downloads and Active Daily Users will give a historical graph since July 2007 (or later if your add-on is newer). The ADU breakdown graphs will sort the values by total count and plot the top 6 so that the graph isn’t horribly cluttered. You can use these plot dropdowns to change any of the plots to another value, or even use the options menu at the right to add more plots. All of these graphs have Firefox and add-on events layered on them so that you can see where the release of a new Firefox or add-on version might have influenced download or ADU numbers. The options menu also allows you to make the graph larger and view the CSV file of the data used in the graph. There’s now an RSS feed of the Statistics Summary box updated every day with the latest download and active daily user totals. By changing the settings of their dashboard, add-on authors can designate their statistics as public or private. All dashboards are private by default, meaning only the add-on authors and Mozilla can see the statistics, with the exception of Total Downloads. The number of total downloads was displayed publicly prior to March 2006, and with the upcoming changes will once again be displayed on the add-on’s display page. Active Daily Users and the detailed breakdowns, however, have never been public before and are only part of the dashboard. If the dashboard is set to public, a link will appear on the add-on’s display page to view the statistics, and anyone browsing the statistics index will see a list of all public stats add-ons to view. There are number of known issues filed and a number of known issues in my head for which I haven’t yet filed bugs. Some of the more annoying issues are actually Timeplot (graphing library) bugs that we’ll work on fixing, such as the value popups overlapping and being hard to identify with a plot. I’m also planning on adding a good bit of documentation to the stats dashboard so that you don’t have to read this blog post to understand how everything works. Feedback on the Stats Dashboard can go to the feedback wiki, or for specific bugs and features, please file a bug.